The unprecedented availability of news archives through new media-based outlets (e.g. YouTube, media company websites) enables audiences to engage with content of a different time and place, or possibly re-engage with content first viewed at a previous time of life. This paper examines this recent phenomenon through case study analysis of two such archival presentations—the 2013 CBSNews.com livestream of its 1963 Kennedy assassination coverage, and the YouTube channel of British Pathé—and how Presence theory (Lombard and Ditton, 1997) might explain the bidirectional temporal journey of viewer and content. Internet-based video streaming provides a new outlet for archival news content that once sat in storage room shelves on reels of aging tape. This content potentially finds new audiences long after its initial purpose as news has passed. The new viewers, however, may be attracted to the archival content for reasons other than historical interest, scholarly research, or nostalgia. Presence in media, as defined by Lombard and Ditton (1997), may offer an explanation for the use of this content on both ends of the sender-receiver media dipole. Taking an examination of one conceptualization of presence in particular, presence as transportation, we can see the bidirectional quality of online news archives. Not only is the viewer being taken by the content to a different time and place, but also the content—produced and disseminated as news for a selected audience at the time and place of its origination—is transported forward in time to become history and cultural memory in the eyes of new viewers or viewers who are re-engaging with the content for second and subsequent times. This paper will assess the relationship between new media technologies, news archives, and presence as transportation in explaining the attraction and experience of viewers to archival content made available via websites or video streaming services such as YouTube. Specifically, two case examples—the CBSNews.com online video streaming of its coverage of the assassination of United States President John F. Kennedy in November 1963, and the newsreel archive of British Pathé on YouTube—will be presented to examine how media presence might work from the perspective of both the viewer and the content. Basing this exploratory research upon case studies is appropriate because “how” and “why” questions are being examined and the subject matter is a contemporary phenomenon—the presentation of archival news content through new media-based dissemination tools—within a real-life context (Yin, 2003, p. 1). In their definitive work on the concept of presence in media, Lombard and Ditton (1997) explain that an enhanced sense of presence is vital to the use, usefulness, and profitability of many newer media technologies. The authors go on to categorize six conceptualizations of presence, including the one of most relevance when discussing archival media content: Presence as transportation. This conceptualization of presence is further divided into three types, which Lombard and Ditton describe as “You are there,” “It is here,” and “We are together” (Concept Explication, para. 7-12). The first two act in congregation to best describe the connection between presence and archival media content. In the same article, Lombard and Ditton note that “You are there” is “perhaps the oldest version of presence.” Citing authors such as Biocca and Levy, Gerrig, Radway, and Kim, the two explain that the concept of taking audiences to a different time and place permeates almost every form of media, from oral storytelling to television commercials. In a similar fashion, viewing archival television news or newsreel film content could psychologically or emotionally transport the viewer to the time and place of the event being reported. Although these emerging technologies are different in a number of ways, each of them (and many others) is designed to give the user a type of mediated experience that has never been possible before: one that seems truly “natural,” “immediate,” “direct,” and “real,” a mediated experience that seems very much like it is not mediated; a mediated experience that creates for the user a strong sense of presence (1997, Introduction, para. 1). While streaming video remains a mediated experience at its core, its dissemination through services like YouTube, Hulu, Vimeo, and others results in a reception environment where content choice, time of viewing, and interactive feedback (e.g. comments or ratings on the same webpage) lie within control of the user. When compared to traditional models of broadcast media, particularly television, the overall experience could feel less mediated. Tied to the “It is here” direction within the presence as transportation concept is the idea of the sender moving the content to the time and place of the receiver. Using a broader definition of media, Foote (1990) describes some of the considerations and complications of transmitting information forward into the distant future with a case example of a U.S. government effort in 1980 to effectively mark areas where underground nuclear waste is buried. Due to the thousands of years required for the radioactive material to decay into less dangerous isotopes, this communicative effort required means of conveying safety information to societies and cultures whose languages and cultures may be vastly different from that of people in the twentieth and twenty-first centuries. The task force created to develop an effective strategy for such a unique communicative endeavor eventually recommended a multimedia approach that included the creation of a universal biohazard symbol. “Taken together,” Foote concludes, “these efforts reflect the varied resources societies have at their disposal for extending the temporal range of communication” (1990, p. 383). In a similar sense, Internet-based streaming video stands as an early twenty-first century tool with which providers of archival film or broadcast content can transport that content from its original medium to one which will reach new (and supposedly younger) audiences. New media technologies like streaming video could be described, in essence, as a different “language” spoken by millennials in contrast to the traditional, terrestrial forms of media familiar to previous generations. Human fascination with the past could be another key ingredient in understanding audiences for archival news content. Although he was writing nearly one decade prior to the arrival of public Internet access, Lowenthal (1985) tapped into the deeper psychological spurs that drive humans into a search for items and events associated with the past: “Present-day absorption with the past reflects needs that transcend partisan purposes or personal nostalgia” (p. 367). Lowenthal also evokes presence as transportation—12 years prior to the publication of Lombard and Ditton’s seminal work—in referring to the transportation qualities of movies and photographs that “plunge us into a vivid past—or bring that past directly into the present—seemingly without mediation” (p. 367). Lowenthal’s words ring true today with the enormously broader access to archival films, images, and television broadcasts afforded to nearly anyone with access to a broadband Internet connection or, in the advent of mobile smartphone technology, a suitable handset within range of a high-speed cellular data network. Considering YouTube as an archive helps explain the different terms of space and time in Internet video. Again, instead of contrasting this with television or film, we could discuss YouTube in terms of flows of people, much as they flow through any other library or collection. Although these are not precisely the same as archives, studies of museum exhibitions have shown that, despite the best efforts of those who build the exhibitions, people rarely spend much time on each object, and the paths that people take vary wildly [Hein, 1998; Serrell, 1997] (p. 45). Taking Gehl’s argument, traditional media companies making archival content available on new media outlets like YouTube may attract viewers much like a museum. Curating their own experience through the offered online archives brings viewers a sense of presence as transportation into chosen times and places via the content, while also pushing the content into a public awareness it might not otherwise have locked away in storage facilities. Temporal awareness as it concerns news events or specific programming may be another factor that convinces audiences to seek archival content, and likewise spur media providers into making that content available whether on physical media or as an Internet-based offering. Major anniversaries of events, in particular, may heighten the awareness or stoke efforts to preserve media content relative to that event. Cariani (2011), detailing a painstaking effort to encourage preservation of local television station archives, including locally produced programming from past years, notes “a growing awareness of the importance of local materials that coincides nicely with the 50-year anniversary of many TV stations” (p. 145). The passage of time and the memories of viewers and those involved with the production of such programming may help create fertile ground for commemorative media productions. CBS News activated this very concept in a unique online special in November 2013. Commemorating the fiftieth anniversary of the assassination of United States President John F. Kennedy, the network took the wraps off its full, live coverage of the event and aftermath from November 22-25, 1963, digitized it and put it up for live streaming video viewing at the exact same hours and dates 50 years into the future from the actual event. By streaming the exact same coverage of those four days in 1963 to viewers in 2013, the network provided more than just a window in time, in a sense. Placed into the theoretical framework of presence as transportation, it can be argued that the time-warping live stream presented online viewers with a psychological and emotional experience of the event—widely agreed to be one of the most pivotal in United States history—even to those who were too young to remember the actual event or were not yet born. For those who did remember the actual event in 1963 and were old enough to mentally process the media coverage that took place, the online video streaming may have provided a psychological tunnel back to that time, accompanied by reconstructed memories of where they were and who they were with when viewing the content originally over television broadcast. Published academic research has not yet appeared to offer an in-depth analysis of CBS’ live stream of its Kennedy assassination coverage or audience effects of that video stream. The approach of the fiftieth anniversary of Kennedy’s assassination, however, yielded a large number of newspaper, magazine, and online articles on the significance of the event in American history, as well as advances about CBS News’ plans to live stream its exact four-day coverage from November 22-25, 1963, in real time. Some media outlets commented on the impact of the 1963 coverage itself as being a watershed moment for television news. Noting that it had been only two months earlier that the three television networks at the time—CBS, ABC, and NBC—had expanded their nightly newscasts from 15 minutes to 30 minutes, Sneed (2013, para. 2) wrote “Kennedy’s assassination set a new standard for how breaking national news stories could be delivered on television, at a coverage level that would go unmatched until the terrorist attacks on the World Trade Center in New York in 2001.” Small wonder, then, that CBS News would seize the opportunity to broadcast such pivotal content in its entirety on a medium that has now transformed television in a different way. In 2013 the CBS web stream, and the way the company used it, came in a vastly different context. It was just one of many fast-moving situations in the media business—most involving enterprises that weren’t in the realm of anyone’s imagination 50 years ago—that we saw this Nov. 22-26. They included the sale of a web news startup to another startup; an apparent shakeup at a major business news and information service; and the hiring of a TV superstar by a web company that, by today’s standards, is itself almost old media (2013, para. 4). In that context, viewers of the live stream on CBSNews.com were experiencing a type of media presence that, ironically, consisted of the news media itself, one of television finally usurping print as the fastest and most reliable medium for breaking news and young journalists like Walter Cronkite, Bob Schieffer, and Dan Rather coming of age and heading onto the path that would make them, and others, media icons in the decades to follow (Thornton, 2013). From the standpoint of older viewers, it should also be noted that the presentation of the CBS coverage of the Kennedy assassination as an exact, temporal replica from 1963 may have brought about another conceptualization of presence in media, that of presence as immersion (Lombard & Ditton, 1997). Those viewers who were old enough in November 1963 to mentally process the network’s coverage of the event and aftermath conceivably could have used the 2013 streaming video of the same coverage as a means to reconstruct memory and engage in an online version of collective memory. Collective memory is formed by social influences and content largely dictated as experience through social structures such as government and family (Halbwachs, 1992, p. 51). Citing Tuchman (1978), Severin and Tankard (2001) present the idea of news as a social construction of reality; therefore, it could be argued that news provided through mass media exists among the social entities that help shape collective memory. Re-engaging with news broadcasts initially seen and heard at the actual time of the event thus may enact the psychological aspect of presence as immersion (Lombard & Ditton, 1997, Concept Explication, para. 13-15) as well as that of presence as transportation, bringing the person back to the setting (e.g. the room of the house wherein the television set transmitted the breaking news and subsequent coverage) of the original experience. Given the generally agreed-upon historical and social portent of the Kennedy assassination, one might think any component of a 50-year observance of the event would warrant massive publicity in advance. Interestingly enough, however, CBS gave the live video stream of its November 1963 coverage of the assassination “minimal publicity, though it really did make for some extraordinary Web viewing” (Bednarski, 2014, para. 8). Viewership figures of the four-day live stream, or any part of it, have not been made publically available. However, CBS has made highlights of its 1963 Kennedy assassination coverage available on a DVD for purchase, suggesting that there remains an audience for the archival content even after the anniversary-tied streaming video event. In addition, just weeks after the Kennedy assassination coverage on CBSNews.com, the network announced a new business unit known as CBS News Live Experiences to utilize the network’s news archives for special multimedia presentations tied to historical events (Bednarski, 2014). This decision suggests the network had enough viewership and response to its Kennedy assassination coverage in November 2013 to warrant similar efforts on major anniversaries of other news events going forward, and perhaps validating the effectiveness of presence as transportation when archival news content hits new media. British Pathé is the archival descendant of Pathé News, one of the major producers and suppliers of cinematic newsreels for much of the twentieth century. The company’s beginnings go back to its namesake, French inventor Charles Pathé, credited with pioneering the development of the moving image in the 1890s. The company began producing newsreels of major events in the United Kingdom and other parts of the world in 1910, and by the 1930s had added production of what it called “cinemagazines,” covering culture, entertainment, and women’s issues. The rise of television news in the 1960s signaled the end for cinematic newsreels as a primary source of news, and Pathé ceased production of newsreels in 1970 (“About us,” 2013). After starting a YouTube channel in 2011 to feature some of its newsreel content, British Pathé in April 2014 announced through its official blog that it was making its entire collection—about 85,000 films spanning 1896-1976—available on YouTube. In announcing the decision to make YouTube one of the archive’s primary online access points, British Pathé General Manager Alastair White stated, “This archive is a treasure trove unrivaled in historical and cultural significance that should never be forgotten. Uploading the films to YouTube seemed like the best way to make sure of that” (“British Pathé releases 85,000 films on YouTube,” 2014). Because British Pathé’s primary focus in its past existence was newsreel content to be shown in cinemas and theaters, largely in the days prior to the dominance of television as the source of news for most first-world households, a new media outlet like YouTube has arguably given the content new life through a venue unavailable in the late twentieth century. White’s comment signifies the technological and cultural arrival of YouTube as both a method of reaching new audiences with the archive’s library of films and as a vehicle for digitally preserving the content of those films. The same comment also suggests that users of YouTube should look to British Pathé and its archive for a definitive film record of major events and cultural information pertaining to the world for much of the twentieth century, a self-appointment as authoritative resource that is echoed in the main channel’s introductory video with “If it happened, we were there” (“Welcome to British Pathé,” 2014). With such a vast collection of film being made available, curation becomes vital to directing YouTube viewers to the type of content they seek. British Pathé addresses this objective by sorting content into topical “channels,” such as “War Archives” and “Sporting History,” as well providing short, narrated compilation videos, such as “People Who Changed the World” and “Ten Tragedies Caught on Film,” for viewers seeking shorter, more generalized video content (“British Pathé,” 2014). Although much of the available content on the YouTube channel is from a British perspective, viewers can find archival content from the United States as well. The American arm of the Pathé newsreel company, which was known as Warner Pathé after Warner Brothers purchased it in 1931, eventually had its archive merged back into the British Pathé holdings. (“About British Pathé,” 2013). Therefore, while a viewer can find original newsreels documenting several FA Cup (soccer) finals, the newsreel depicting the 1940 Rose Bowl game also has a home in the same archive. When viewed through the lens of presence as transportation, much of the British Pathé archives might appeal not only to older generations and history buffs of all ages, but also to those curious about a news dissemination process prior to the time television news broadcasts came to the media forefront. Particularly with the newsreel excerpts littered throughout the company’s YouTube channel and its own website, the accompanying music and large, sometimes-artistic titles announcing the event or subject may give the streaming video viewer a sense of what it was like to receive news from around the world while sitting in a darkened movie house awaiting whatever might be the feature film of that evening. Taking the opposite approach within presence as transportation, the British Pathé videos are moving the sights, sounds, and societal and cultural nuances of various years in the twentieth century into a distinctively twenty-first century viewing environment. This may enable viewers of the content, particularly young viewers, to gain a more thorough understanding of differences across a broad span of time. In essence, warfare back then did not look the same as it does now, and cars and fashion looked much different as well. The overarching effect is one of letting viewers pick and choose a time and place with which to engage, either in historical interest or memory, or both. British Pathé also produces “list” videos for its YouTube channels, repurposing archival content in short video packages that center on a particular theme of cultural interest, such as memorable sporting events or obsolete occupations. With such a vast array of archival content to be found among the British Pathé content on YouTube, it is interesting to examine exactly what topics draw the strongest viewership. Despite the fact that only a portion of the videos now available have been on the channel since its inception in 2011, a select few have already garnered more than 1 million views as of December 2014. Taking the top 20 viewed videos of British Pathé’s YouTube channel as of the same date, we find exactly half are content depicting tragedies and disasters, including one compilation video. In the twenty-first century West, death’s presence to sight and feeling is narratively framed and given to experience predominantly through the technology of the camera. Indeed the camera, its ownership and usage amongst a mass global population has reorganized where and how scenes of dying and death are seen and who or what makes this possible (p. 12). The same authors note the cultural significance of celebrity deaths (including the Kennedy assassination) as public spectacle and cite YouTube as a popular medium for displaying video chronicles of death and the dying process (pp. 12-13). As if testimony to that point of analysis, the British Pathé video of the 1997 death of Princess Diana in a car accident has garnered just less than 1 million views as of December 2014. However, the most viewed video on the British Pathé YouTube channel in its first three years of existence is a patch of two highlight reels of bodybuilding competitions, one in Cologne, Germany, in 1966, and the other being the Mr. Universe competition of 1969. The draw? Both short clips feature a young, unknown Arnold Schwarzenegger as a contestant. The presence-based attraction of this video centers on viewers being able to get a glimpse of Schwarzenegger long before he became an actor best known for Hollywood blockbuster action films in the 1980s and 1990s. While the celebrity factor would certainly drive up views, it is interesting to note that this bodybuilding competition video currently tops the list by more than 600,000 views over the second most-watched video, the aforementioned compilation of tragedies caught on film (“Arnold Schwarzenegger Wins Mr Universe,” 1969). Through the two case examples analyzed in this paper, we have seen the ability of new media to create a bidirectional pattern of media presence through archival content. Viewers of generations outside of and forward from the time of the content’s original creation and dissemination are able to engage with that content and experience a presence-based transportation to the time and place of the content. However, new media also acts in a transporting fashion for the content, taking it from the ages of the cinematic newsreel and the early days of broadcast television journalism to a media technology—in this case, online streaming video—associated with a future time period, from the perspective of the original dissemination of the content. Alongside giving archival content a new home, new media also provides the content with a potential marketplace, although just how profitable a marketplace remains to be seen. 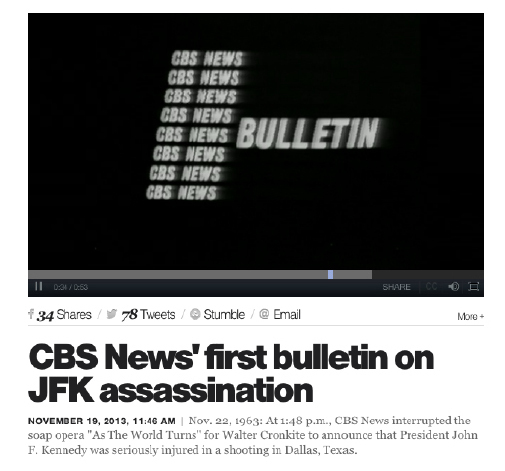 Still, CBS followed up its real-time video streaming of its news coverage of the Kennedy assassination with the offer of a DVD collector’s set featuring highlights of the same coverage. British Pathé allows free viewing online of its archives, but continues to make money through licensing use of the content for professional purposes. Both companies exhibit the fact that their archival news footage still carries some marketplace value to at least niche audiences interested in seeing or using the content. Profitability for content owners notwithstanding, Lowenthal’s analysis of human desire for engagement with the past marches on as the technologies to find that past continue to change. The fascination with news archives in general carries on with cheaper, simpler methods of digitization of such content and outlets like YouTube, blogs, and social media like Facebook and Twitter, where media content or links to it can be shared daily. The Internet Archive itself offers a sumptuous selection of clips from television newscasts from 2009 onward, indicating that the concept of news as a window into the past is unlikely to fade anytime soon. Additionally, the move toward convergence journalism by traditional print media means that there are digital multimedia archives possible for these companies to re-purpose at various points in the future. Although this paper presents an examination of the usefulness of archival news within new media technologies and an attendant theoretical framework of presence, future research should attempt to analyze audience effects, both psychological and emotional, of engagement with archival news content. Particularly in the matters of collective memory and memory reconstruction, it would be interesting to see if effects could be measured, quantitatively through clinical studies and post-experiment surveys or qualitatively through focus groups, among people viewing archival news content they had initially viewed at an earlier time in life. Exploring this suggested path of research, however, may also point to a potential pitfall as to the long-term value of archival news. Although the general historical value of archival news film and video is unlikely to deteriorate, we should remember its audiences are human beings who pass on from life and take their memories of news events with them. Questions are then raised about the potential effects, wider interest in, and marketability of archival news content once its witnesses through the original media coverage are all gone. Cohen, examining this very mortal aspect of memory and personal significance of archival news content, states about the Kennedy assassination, “Fifty years from now, we’ll still mark the occasion, only it will be something like this: ‘Last Surviving Witness to Kennedy Assassination …’ The river of history thus ever flows” (2013, para. 4). Then there remains the question of what future media will be in place, how they will work, and what appearances they will take. Although streaming video seems to have risen to the role of major media technology, thriving not only in homes and businesses but also on mobile devices like tablets and smartphones, we cannot assume such a paradigm will continue to exist later this century or beyond. To draw a parallel with the fiftieth anniversary presentation of CBS’ 1963 coverage of the Kennedy assassination, one wonders what technology might exist and how digital news archives will be presented of the September 11, 2001, terrorist attacks in the United States when its fiftieth anniversary arrives in 2051. What we can confirm approximately 15 years into the twenty-first century is that the development of broadband Internet access, and new media technologies like streaming video, has provided news organizations with a conduit to feature their archival content—and, perhaps, a reason to preserve it. More than ever before, the past is not very far away. Even more exciting may be that it takes only a mouse click or a tap on a touchscreen to get there. Halbwachs, M. (1992). On collective memory. Chicago, IL: University of Chicago Press. Lowenthal, D. (1985). The past is a foreign country. New York, NY: Cambridge University Press. Severin, W. J., & Tankard, J. W. (2001). Communication theories: Origins, methods, and uses in the mass media (5th ed.). New York, NY: Longman. Yin, R. K. (2003). Case study research: Design and methods (3rd ed. ed.). Thousand Oaks, CA: Sage Publications. Terry L. Britt is a master’s student in media research and theory at the University of Texas at Austin. He spent the better part of three decades—beginning in 1980 at age 14—as a sports reporter, general news reporter, feature writer, sports editor and copy editor for various weekly and daily publications in Texas, Arkansas, Tennessee and Mississippi. Having dropped out of college in 1988 after 3 1/2 years at Memphis State University (now the University of Memphis) and after a failed second attempt at the University of Tennessee at Knoxville in 1990, Britt finally completed a bachelor’s degree in English with a minor in journalism at the University of Texas at Tyler in 2013. He presented an original research paper, “Bringing back the past: New media and archival media providers,” at the AEJMC Conference in Montreal, Quebec, Canada, in August 2014, and is currently preparing that paper for publication. His research focuses upon media psychology and media sociology as they apply to conceptions of time and space, new media uses and gratifications, and digital identity and ownership. He currently serves as the digital media coordinator for the Institute for Geophysics at UT-Austin.